Department of Clinical Biology, Tohoku University Graduate School of Medicine, Miyagi, Japan; Division of Medical Science, Tohoku University Graduate School of Biomedical Engineering, Miyagi, Japan; andDepartment of Clinical Biology and Hormonal Regulation, Tohoku University Graduate School of Medicine, Miyagi, Japan. Nephronophthisis (NPHP)-related ciliopathies are recessive, single-gene disorders that collectively make up the most common genetic cause of CKD in the first three decades of life. Mutations in 1 of the 15 known NPHP genes explain less than half of all cases with this phenotype, however, and the recently identified genetic causes are exceedingly rare. As a result, a strategy to identify single-gene causes of NPHP-related ciliopathies in single affected families is needed. Although whole-exome resequencing facilitates the identification of disease genes, the large number of detected genetic variants hampers its use. Here, we overcome this limitation by combining homozygosity mapping with whole-exome resequencing in a sibling pair with an NPHP-related ciliopathy. Whole-exome capture revealed a homozygous splice acceptor site mutation (c.698G>T) in the renal Mg2+ transporter SLC41A1. This mutation resulted in skipping of exon 6 of SLC41A1, resulting in an in-frame deletion of a transmembrane helix. 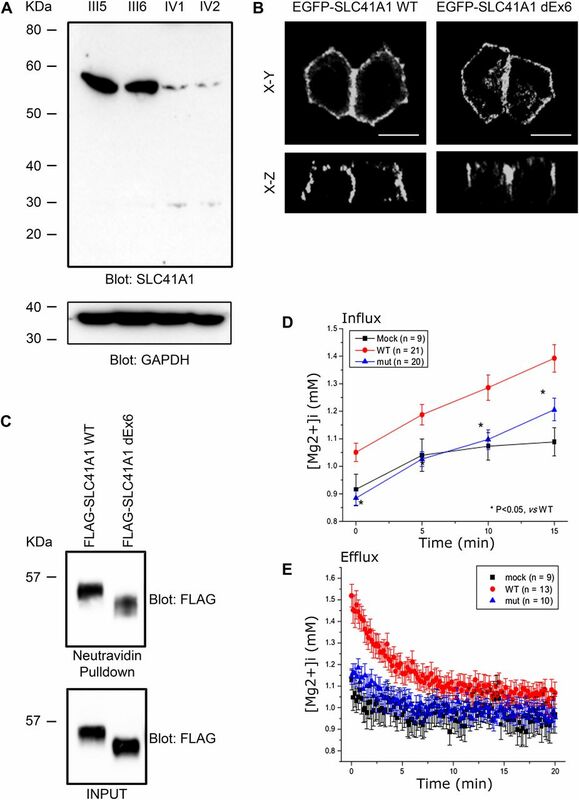 Transfection of cells with wild-type or mutant SLC41A1 revealed that deletion of exon 6 completely blocks the Mg2+ transport function of SLC41A1. 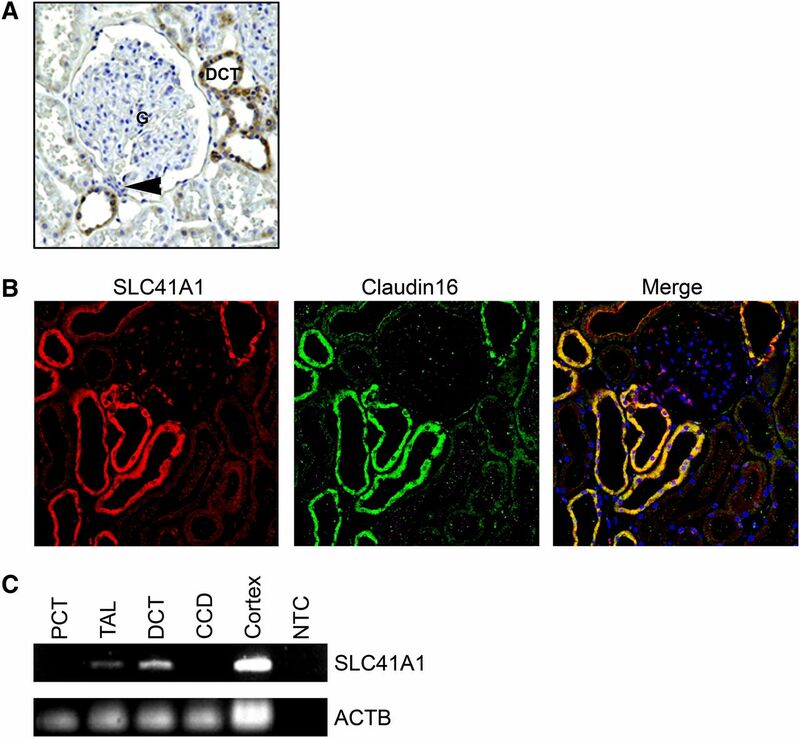 Furthermore, in normal human kidney tissue, endogenous SLC41A1 specifically localized to renal tubules situated at the corticomedullary boundary, consistent with the region of cystogenesis observed in NPHP and related ciliopathies. Last, morpholino-mediated knockdown of slc41a1 expression in zebrafish resulted in ventral body curvature, hydrocephalus, and cystic kidneys, similar to the effects of knocking down other NPHP genes. Taken together, these data suggest that defects in the maintenance of renal Mg2+ homeostasis may lead to tubular defects that result in a phenotype similar to NPHP. Rare CKDs make up the majority of CKD cases treated within long-term dialysis and renal transplantation programs in the first three decades of life but are notoriously difficult to diagnose.1 Rare recessive mutations cause chronic diseases that often require hospitalization.2 However, half of their single-gene causes are still unknown (http://omim.org/statistics/entries). Because recessive single-gene mutations directly represent the disease cause, gene identification offers a powerful approach to revealing disease mechanisms. Furthermore, because recessive mutations predominantly convey loss of function, recessive single-gene defects can be transferred directly into animal models to study the related disease mechanisms and to screen for small molecules as possible treatment modalities. The finding that some of the more recently identified genetic causes of NPHP-related disorders are exceedingly rare necessitates a strategy to identify novel single-gene causes of these conditions in single affected families.15 In this context, the new method of whole exome capture with consecutive massively parallel sequencing (here called whole exome resequencing [WER]) theoretically offers a powerful approach toward gene identification in rare recessive diseases. However, the utility of WER is hampered by the large number of novel genetic variants that result from whole exome sequencing in any given individual.18,21 To overcome this limitation of WER, we developed a strategy that combines WER with homozygosity mapping.18 Using this approach, we have identified mutation of the renal magnesium transporter gene SLC41A1 as a novel genetic cause of disease that phenocopies NPHP-related conditions clinically, ultrasonographically, and histologically. To identify additional causative mutations for NPHP-related disorders, we performed WER in a consanguineous Italian family (F438) with an apparent NPHP-related disorder phenotype (Figure 1A). 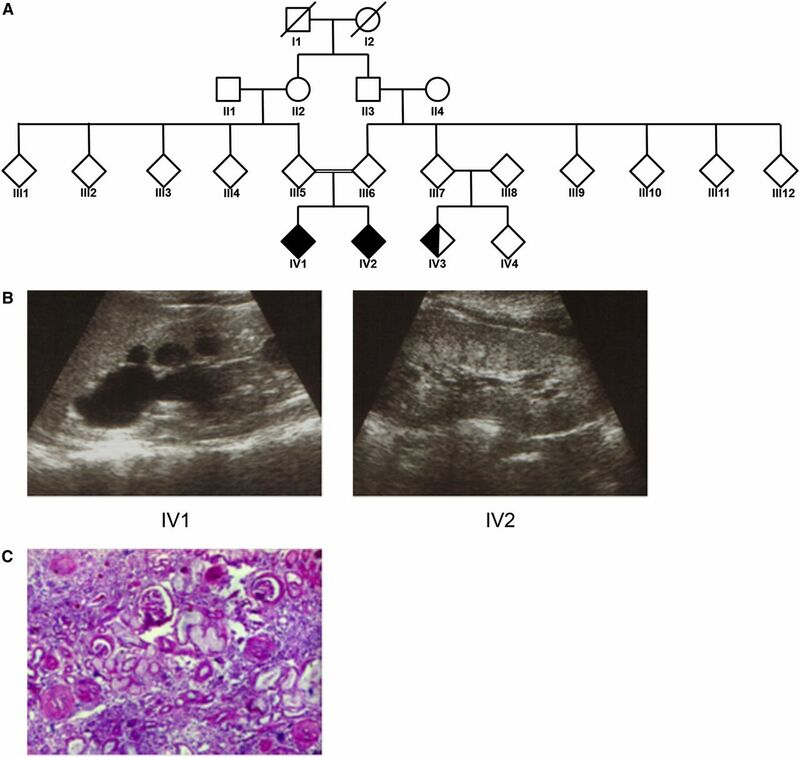 In this large family, two siblings born from first cousins (IV1 and IV2) displayed the unusual association of apparent NPHP with bronchiectasis. Renal ultrasonography and biopsy indicate characteristic hallmarks of nephronophthisis. (A) Pedigree for family F438. Individuals IV1 and IV2 display both NPHP and primary ciliary dyskinesia (shaded shapes). Individual IV3 has only primary ciliary dyskinesia (half-shaded). (B) RUS showing increased echogenicity, corticomedullary cysts, and loss of corticomedullary differentiation in patients F438-IV1 (left panel) and F438-IV2 (right panel). (C) Renal histologic findings from a renal biopsy specimen from F438-IV1 showing the characteristic triad of tubular ectasia, tubular basement membrane disruption, and tubulointerstitial infiltrations (Trichrome-Masson staining). Patient IV2 had had frequent episodes of fever, coughing, and respiratory infections since the first month of life, and chest radiography demonstrated the persistence of inflammatory infiltrates in the lung. High-resolution computerized tomography revealed bronchiectasis, and fiberoptic bronchoscopy showed reddening of the bronchial mucosa with purulent secretion. Evaluation of bronchoalveolar lavage showed a marked increase in the percentage of neutrophils and the presence of Pseudomonas aeruginosa. At age 8 years, the patient was referred to the Nephrology Department because of observed polyuria and polydipsia. Initial urine analysis revealed low urine osmolarity (380 mOsmol/kg in fresh morning urine), and blood analysis displayed renal insufficiency with serum creatinine levels of 2.37 mg/dl. Renal ultrasonography showed bilateral irregular echogenicity, with both kidneys decreased in size (Figure 1B). Percutaneous renal biopsy showed periglomerular fibrosis, tubular ectasia, tubular basement membrane disruption, and tubulointerstitial infiltrations (Figure 1C). On the basis of these clinical findings, a diagnosis of NPHP was proposed. The patient underwent peritoneal dialysis at age 9 years before undergoing kidney transplantation at age 10. Patient IV1, like his sibling, had had a history of fever, coughing, and respiratory infections since the first month of life. IV1 also presented with polyuria and polydipsia with low urine osmolarity (420 mOsmol/kg) and serum creatinine level of 1.5 mg/dl at 5 years of age. Renal biopsy and renal ultrasonography showed similar findings as for patient IV2 (Figure 1B). Progression of renal damage led to ESRD at age 10 and initiation of peritoneal dialysis. Patient IV3 is a first-line cousin of siblings IV1 and IV2. She presented with chronic bronchitis and bronchiectasis at age 6 years. However, by age 11 no signs of polyuria or polydipsia were present and results of blood and urine analysis were normal. In addition, renal ultrasonography revealed no abnormalities in kidney size or structure. Homozygosity mapping performed on patient IV1 yielded eight homozygosity peaks (Figure 2A). By WER, we detected four homozygous variants (Supplemental Table 1) whose segregation pattern fit a recessive mode of inheritance. Of these four variants, only the variant in the SLC41A1 gene was not a known single-nucleotide polymorphism (SNP) and was absent from both the 1000 Genomes and Exome Variant Server databases (Supplemental Table 2). Furthermore, only the SLC41A1 variant was predicted to be damaging by all four predictive tools used (Polyphen 1, Polyphen 2, MutationTaster, SIFT [Supplemental Table 2]). In addition, only two of the variants (SLC41A1 and ZNF224) display strong evolutionary conservation at the mutated residue (Supplemental Table 3). Finally, the homozygous missense mutation (c.698G>T, p.G223V) in SLC41A1 resides within an evolutionary conserved exonic splice acceptor site in exon 6 of SLC41A1, probably resulting in missplicing of the SLC41A1 transcript and thus a potentially more deleterious mutation. This mutation was absent from 100 European-American healthy controls and also absent from 80 regionally matched healthy controls (G. Caridi, personal communication). These data together suggest that SLC41A1 as a novel causative gene of an NPHP-related disorder phenotype (Figure 2, B and C). Recessive mutation in SLC41A1 in family F438 identified by whole exome capture and homozygosity mapping. (A) Homozygosity profile for patient IV1. Nonparametric logarithm of odds scores were plotted over genetic distance across the genome, where chromosomal positions are concatenated from p- to q-arm (left to right). Arrowhead shows the SLC41A1 locus. (B) Diagram of the human SLC41A1 gene showing exon number and primer locations. Red arrow shows position of the c.698G>T splice acceptor site mutation. (C) Sanger-sequencing confirmation of the c.698G>T mutation in SLC41A1. Altered nucleotide and amino acid change are given above the sequence trace. WT control sequence and trace are shown below the mutated sequence. Codon triplets are underlined to indicate reading frame. Noncoding sequence is in lower case. Mutated nucleotide is denoted by arrowhead. (D) RT-PCR was performed on RNA from lymphoblastoid cells prepared from parents (III5 and III6) and affected siblings (IV1 and IV2) using the primers indicated. Positions of primers is indicated in B. M, 100-bp DNA ladder. (E) Sanger sequencing of the fast and slow migrating RT-PCR products (primers P1 + P3) revealed that the c.698G>T mutation results in skipping of exon 6 (upper trace). To test whether the c.698G>T mutation impairs normal splicing of the SLC41A1 transcript, Epstein Barr virus (EBV)–transformed white blood cells were prepared from blood samples from both parents (III5 and III6) and the two affected siblings (IV1 and IV2). RT-PCR was performed using primers flanking exon 6 (Figure 2B) on cDNA prepared from both the EBV-transformed white blood cells. This test revealed that in both parents, one PCR product of the expected size and an additional faster-migrating PCR product was observed (Figure 2D, upper panel), consistent with the fact that both parents are heterozygous for the c.698G>T mutation. In contrast, RT-PCR on patient-derived cDNA yielded only the single faster-migrating band (Figure 2D, upper panel). Sanger sequencing of this faster-migrating band revealed that it arises from skipping of SLC41A1 exon6 (Figure 2E). Consistent with this observation, further RT-PCR using a forward primer designed against exon 6 (P2; Figure 2B), revealed no detectable PCR product in the two affected siblings but did show a PCR product of the expected size in the two parents (Figure 2D, middle panel). Together, these data demonstrate that the c.698G>T mutation results in missplicing of the SLC41A1 transcript. The SLC41A1 mutations that results in skipping of exon 6 is predicted to result in an in-frame deletion of a transmembrane domain. We next tested whether this deletion abrogates expression of SLC41A1. Western blotting of protein lysates generated from both parental and patient-derived cell lines revealed almost complete loss of SLC41A1 expression in the two affected siblings (Figure 3A). The c.698G>T mutation results in reduced expression and loss of function of SLC41A1. (A) Western blot of lysates prepared from parents (III5 and III6) and affected siblings (IV1 and IV2) showing decreased expression of SLC41A1 in affected siblings. Anti–glyceraldehyde 3-phosphate dehydrogenase (GAPDH) Western blot was used as loading control. (B) EGFP-tagged WT SLC41A1 and SLC41A1 lacking exon 6 (dEx6) were transiently transfected into MDCKII cells. Cells were fixed and EGFP fluorescence captured by confocal microscopy. (C) HEK293 cells transiently transfected with WT or dEx6 FLAG-tagged SLC41A1 were biotinylated at the cell surface before lysis. Cell lysates were then subjected to pulldown with neutravidin beads before SDS-PAGE and Western blotting with the indicated antibodies. (D) HEK293 cells were transfected with empty vector (MOCK) WT or dEx6 EGFP-SLC41A1 before loading with mag-fura2-AM. To measure magnesium influx, cells were exposed to high Mg2+, low Na+ solution, and radiometric fluorescent images were collected to determine intracellular [Mg2+]. (E) To measure magnesium efflux, cells were treated as above and then switched into magnesium-free media, and radiometric fluorescent images were collected to determine intracellular [Mg2+]. Error bars show standard deviation. We next tested whether the mutated form of SLC41A1 can traffic in a similar fashion as the WT protein. An amino-terminal enhanced green fluorescent protein (EGFP)–tagged SLC41A1 expression construct was generated by cloning the full-length (WT) human SLC41A1 open-reading frame into a mammalian expression vector. In addition, an expression construct with the residues encoded by SLC41A1 exon 6 deleted was cloned from patient-derived cDNA (dEx6). Transfection of the WT and mutant constructs into the MDCKII renal epithelial cell line revealed that both targeted to the basolateral membrane and that the mutant localization was indistinguishable from WT (Figure 3B). Furthermore, using a cell-surface biotinylation assay in which HEK293 cells were transfected with WT or mutant (dEx6) FLAG-tagged SLC41A1, neutravidin pulldown revealed that both the WT and mutant SLC41A1 are trafficked to the cell surface (Figure 3C). These data suggest that the in-frame deletion of exon 6 does not affect the normal trafficking of SLC41A1. Because the in-frame deletion of exon6 did not appear to perturb the normal trafficking of SLC41A1, we next sought to address whether the magnesium-transporting ability of SLC41A1 might be compromised by this deletion. In cells transfected with WT SLC41A1, basal free intracellular Mg2+ ([Mg2+]i) was, on average, 1.12±0.06 mM (n=20), which was significantly higher than that of mock transfected cells (0.81±0.02 mM, n=20). The average basal [Mg2+]i of mutant transfected (ΔE6) cells, 0.87±0.04 (n=33), was very similar to that of mock cells (Figure 3D). To examine the Mg2+ transport activity, cells were exposed to high Mg2+, low Na+ solution (Mg2+ influx). A 15-minute exposure to high Mg2+, low Na+ solution resulted in a robust elevation of [Mg2+]i in WT cells, whereas only small increases in [Mg2+]i were observed in mock and ΔE6 cells (WT, 0.50±0.03 μM/s; mock, 0.21±0.04 μM/s; ΔE6, 0.20±0.01 μM/s). When the extracellular solution was switched to the Ca2+-free Tyrode solution, [Mg2+]i returned to the basal level in WT, ΔE6, and mock cells (Mg2+ efflux). Again, Mg2+ efflux rates were similar in mock cells and ΔE6 cells (Figure 3E). (Comparison of the efflux rates between WT cells and others is difficult because Mg2+ efflux was induced at much higher initial [Mg2+]i in WT cells.) These data indicate that WT has Mg2+ transport activities, whereas ΔE6 mutant has null function. One of the hallmarks or NPHP is the formation of renal cortico-medullary cysts.3,22 To ascertain why loss of SLC41A1 activity may cause the appearance of cysts at the cortico-medullary boundary, we examined whether SLC41A1 is expressed in nephron segments in this region. Indeed, immunohistochemical analysis of SLC41A1 expression on normal human kidney sections revealed expression primarily in the distal convoluted tubules (DCTs) and in the tubule adjacent to the macula densa (Figure 4A). Of note, claudin16, a major regulator of renal paracellular magnesium uptake in which recessive mutations cause renal disease that closely mimics NPHP in cattle,23 was coexpressed in identical tubular segments to SLC41A1 in rat kidney sections (Figure 4B). In previous studies, RT-PCR has shown that claudin16 is expressed primarily in the DCTs and thick ascending limb of nephrons,22 and indeed RT-PCR confirmed that SLC41A1 is also expressed in the DCT and thick ascending limb but is absent from proximal convoluted tubule and cortical collecting duct of microdissected tubular segments (Figure 4C). Together, these data reveal that SLC41A1 is expressed in the DCT, macula densa, and thick ascending limb tubular segments, whose location is entirely consistent with the region of cystogenesis observed in NPHP and related ciliopathies. SLC41A1 localizes predominantly to distal convoluted tubules. (A) Immunohistochemistry was performed on human paraffin-embedded sections using rabbit anti-SLC41A1 antibodies. Signal was seen primarily in the DCTs. G, glomerulus. Arrowhead shows macula densa. (B) Rat paraffin-embedded sections were immunostained with antibodies against SLC41A1 (red) and Claudin 16 (green). DAPI (blue) was used to stain cell nuclei. (C) RT-PCR was performed on human nephron segments with primers for SLC41A1 and actin-β (ACTB) as loading control. CCD, cortical collecting duct; NTC, no template control; PCT, proximal convoluted tubule; TAL, thick ascending limb. To confirm that defective SLC41A1 function can lead to cystogenesis, we examined SLC41A1 function in the zebrafish, a widely used model organism for the study of human ciliopathies. Alignment of the human SLC41A1 protein with the zebrafish homolog revealed extensive conservation with 76% identity at the protein level, suggesting that the zebrafish homolog is likely to function in a manner similar to that of human protein (Supplemental Figure 1). To examine the expression pattern of slc41a1 in zebrafish, an antisense in situ probe was generated. By in situ hybridization, slc41a1 was expressed almost exclusively in the corpuscle of Stannius of the zebrafish pronephros, as previously described24 (Figure 5A). 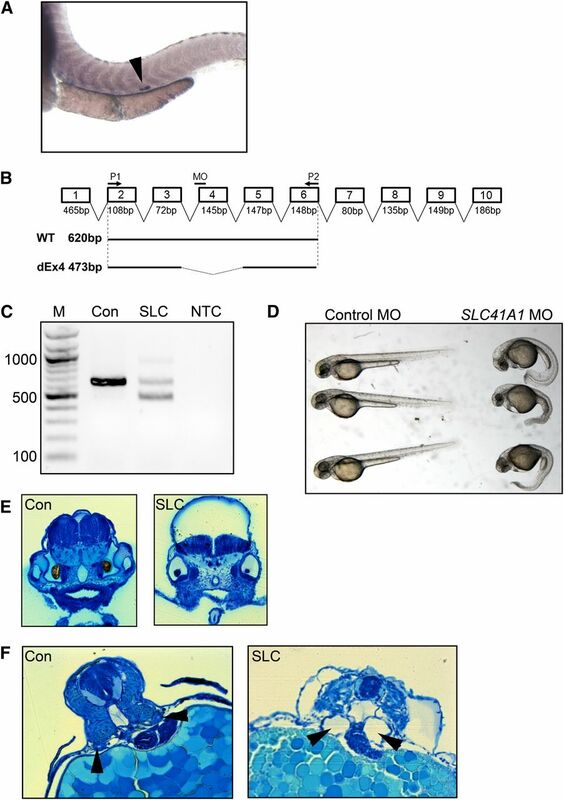 To ablate slc41a1 expression, a splice-blocking morpholino designed against the splice acceptor site of exon 4 (Figure 5B) was injected into 1–2 cell stage zebrafish embryos. Twenty-four hours after injection, embryos were harvested and the efficacy of the morpholino was examined by RT-PCR. RT-PCR of RNA prepared from embryos injected with a standard control morpholino revealed a PCR product of the expected size, whereas embryos injected with the splice-blocking morpholino exhibited a faster-migrating product indicative of missplicing consistent with skipping of exon 4 (Figure 5C). Knockdown of slc41a1 expression in zebrafish results in kidney cysts. (A) In situ hybridization of 48-hour-old zebrafish embryos with an antisense slc41a1 probe showing expression in the corpuscle of Stannius (arrowhead). (B) Schematic diagram of the zebrafish slc41a1 gene showing location of the splice-blocking morpholino (MO) and primers used for RT-PCR (P1 and P2). Shown below are expected RT-PCR products using primers P1 and P2 on WT and splice morpholino injected (dEx4) samples and their expected sizes. (C) RT-PCR was performed on RNA prepared from embryos 24 hours after injection with standard control (Con) or slc41a1 splice-blocking morpholino (SLC). Shown on the left are the sizes (in bp) of the major bands of the DNA ladder (M). NTC, no template control. (D) Phenotypic appearance at 48 hours of control and slc41a1 morpholino–injected embryos. (E) Methylene blue–stained plastic sections showing prominent hydrocephalus in slc41a1 morpholino–injected embryos (right panel) compared with control morpholino–injected embryos (left panel). (F) Methylene blue–stained plastic sections showing tubular dilation (cysts) in slc41a1 morpholino–injected embryos (right panel) compared with control morpholino–injected embryos (left panel). Arrowheads show pronephric tubules. To examine the effect of loss of slc41a1 expression, 48 hours after morpholino injection, the morphology of control and slc41a1 morphants was examined. Control morphants examined no obvious phenotype, whereas slc41a1 morphants displayed severe developmental abnormalities (Figure 5, D and E). Specifically, >70% of slc41a1 morphants exhibited severe ventral body curvature, a phenotype frequently observed upon knockdown of NPHP genes, compared with <2% of embryos injected with the control morpholino (Figure 5D and Supplemental Table 4). In addition, a high proportion (>50%) of the slc41a1 morphants displayed severe hydrocephalus compared with control morphants (Figure 5D). Morphologic analysis of sections through the hindbrain of slc41a1 morphants showed extensive dilation of the ventricle compared with controls (Figure 5E). NPHP-related disorders (including Bardet Biedl, Joubert, Senior-Loken, and Meckel syndromes) display significant locus heterogeneity, with causative mutations occurring in more than 30 different genes. Causative mutation frequency among these genes is not homogenous, ranging from frequent mutations (NPHP1, mutated in about 20% of all cases of NPHP-related disorders in our cohort) to extremely rare mutations (GLIS2/NPHP7, mutated in a single family).15,26 It would appear that mutation of SLC41A1 represents an extremely rare cause of NPHP-related disorders similar to GLIS2/NPHP7, as screening of 1000 patients with NPHP-related disorders using a newly developed high-throughput sequencing technique failed to identify any additional patients with SLC41A1 mutations.27 Furthermore, it is likely that the identified splice site mutation in SLC41A1, resulting in the skipping of exon 6, may be hypomorphic because a small amount of protein product was still detectable in the two affected patients (Figure 3A). Consequently, one may postulate that null mutations resulting from nonsense mutations or deletions might be embryonic lethal and hence not be represented in our cohort of patients with NPHP-RC. What remains to be ascertained in this case is the cause of the bronchiectasis in the two affected siblings and their cousin. The identified mutation in SLC41A1 can explain the renal phenotype of the two affected siblings but cannot explain the cause of bronchiectasis because the cousin who had lung dysfunction but no renal disease is heterozygous for the SLC41A1 mutation. A dominant effect for the SLC41A1 allele is unlikely because neither parent of the two affected siblings who are heterozygous for the mutant SLC41A1 allele showed any bronchiectasis phenotype. The possibility that the cousin had a compound heterozygous mutation in SLC41A1 was ruled out as Sanger sequencing of all exons failed to identify additional mutations (data not show). The bronchiectasis phenotype probably arises from mutation of a separate gene. Using our exome data, we searched for mutations in all known primary ciliary dyskinesia genes, and although we did find variations in several, none of them segregated correctly with affected status within the family (Supplemental Table 5). Alternatively, the respiratory problems observed in the cousin (IV3) may be a phenocopy of the disease observed in the two siblings (IV1 and IV2). This is supported by the observation that the two affected siblings displayed symptoms of lung dysfunction soon after birth, whereas the cousin only exhibited problems at age 6 years. Intracellular Mg2+ is a cofactor for enzymes and signal transduction proteins and regulates bioenergetics, ion transport, growth, and proliferation. [Mg2+]i is thought to be maintained by transport across cell membranes with Mg2+ transporters. SLC41A1, a member of the solute carrier family 41, is a cell membrane protein expressed in various tissues, including heart, brain, kidney, liver, and colon, and has been proposed as one of the candidates for such Mg2+ transporters.28–30 Although Mg2+ transport by SLC41A1 has not been fully characterized, Kolisek et al. recently reported that the human SLC41A1 gene encodes for the Na+/Mg2+ exchanger 4.28 The finding that mutations of this renal Mg2+ transporter mimics an NPHP-RC phenotype may be related to the fact that other mutations in proteins involved in renal Mg2+ transport are known to cause an NPHP-related disorder phenotype. Specifically, recessive mutations of the CLDN16 gene encoding the renal tight junction protein claudin-16 (also called paracellin-1) cause a recessive renal disease that closely mimics NPHP31 in cattle24 both clinically and histologically. An unusual finding, given that SLC41A1 is an apparent magnesium transporter, is that neither of the affected patients exhibited any abnormalities in serum or urine magnesium content or any evidence of nephrocalcinosis (G. Caridi, personal communication). Hence, the disease phenotype may result from perturbed intracellular magnesium homeostasis rather than global alterations in magnesium levels. It is unclear how loss of correct magnesium homeostasis within the epithelial cells of the distal convoluted tubule could lead to the formation of cysts and the development of the NPHP-related disorder phenotype. Because the majority of cases of NPHP-related disorders are caused by mutations in genes whose products reside at or regulate ciliary function, one possibility is that the SLC41A1 transporter is regulated downstream of the NPHP-protein/ciliary network. Analysis of whether cellular magnesium levels are perturbed upon loss of cilia or knockdown of other NPHP proteins could potentially provide important insight into the pathogenesis of NPHP-related disorders. Of note, SLC41A1 is the first transporter to be identified as causing an NPHP-related disorder, and as such it represents an attractive potential target for pharmacologic intervention for the treatment of these disorders. For genome-wide homozygosity mapping35 the Genome-wide Human SNP 6.0 ArrayII from Affymetrix was used. Genomic DNA samples were hybridized and scanned using the manufacturer’s standard protocol at the University of Michigan Core Facility (www.michiganmicroarray.com). Nonparametric logarithm-of-odds scores were calculated using a modified version of the program GENEHUNTER 2.136,37 through stepwise use of a sliding window with sets of 110 SNPs using the program ALLEGRO.38 Genetic regions of homozygosity by descent (homozygosity peaks) were plotted across the genome as candidate regions for recessive disease-causing genes. Disease allele frequency was set at 0.0001, and Caucasian marker allele frequencies were used. Exome enrichment was conducted following the manufacturer’s protocol for the NimbleGen SeqCap EZ Exome v2 beads (Roche NimbleGen Inc.). The kit interrogates a total of approximately 30,000 genes (about 330,000 consensus coding DNA sequence exons). Massively parallel sequencing was performed largely as described in Bentley et al.39 Sequence reads were mapped to the human reference genome assembly (National Center for Biotechnology Information build 36/hg18) and mutation calling performed using CLC Genomics Workbench (version 4.7.2) software (CLC bio, Aarhus, Denmark). HEK293T and MDCK II cells were cultured in DMEM with 10% FBS in 5% CO2 at 37°C. Transfection was performed using Lipofectamine 2000 (Invitrogen). Cell surface biotinylation assay was performed with the Cell Surface Protein Isolation kit (Thermo Scientific) according to the manufacturer's protocol. Human SLC41A1 was cloned from human kidney cDNA (Clontech). Exon 6–deleted SLC41A1 was cloned from the cDNA made from EBV-transformed proband’s peripheral lymphocytes. SLC41A1 cDNAs were subcloned into pEGFP-C (Invitrogen) or FLAG-tagged pcDNA3.1. Transfected cells were grown on 35-mm glass base dishes (Iwaki, Chiba, Japan) coated with Matrigel (BD Biosciences). Cells were washed with Ca2+-free Tyrode solution composed of (in mM): 135 NaCl, 5.4 KCl, 1.0 MgCl2, 0.33 NaH2PO4, 0.1 EGTA, 10 HEPES, and 2 glucose (pH 7.4 at 25°C by NaOH). After the background fluorescence of the GFP-positive transfected cells were measured, cells were incubated with 5 μM mag-fura-2-AM for 10 minutes, followed by three washes and further 20-minute incubation in the Ca2+-free Tyrode solution on the stage of inverted microscope (TE300; Nikon, Tokyo, Japan). The fluorescence images of mag-fura-2 were collected from the cells at 25°C by a cooled charge-coupled device system (EM-CCD C9100, Hamamatsu Photonics, Hamamatsu, Japan) with a 40× objective (S fluor 40×0.90, Nikon). With alternate excitation at 345 and 380 nm, mag-fura-2 fluorescence images at wavelength longer than 470 nm were acquired, and digitized data were analyzed with image analysis software (Aquacosmos/Ratio, Hamamatsu Photonics). The ratio of fluorescence intensities excited at 380 nm and 345 nm was calibrated in terms of [Mg2+]i as described previously.40 To assess Mg2+ influx, cells were exposed to a high Mg2+, low Na+ solution composed of (in mM): 68.5 MgCl2, 24 Mg-methanesulfonate, 5.4 KCl, 0.33 NaH2PO4, 0.1 EGTA, 10 HEPES, and 2 glucose (pH 7.4), and fluorescence images were obtained at 0, 5, 10, and 15 minutes. To assess Mg2+ efflux, extracellular solutions of the Mg2+-loaded cells were changed back to the Ca2+-free Tyrode solution and fluorescence images were obtained every 10 seconds for 20 minutes. To knock down zebrafish slc41a1, a splice-site blocking morpholino was designed against the slc41a1 exon 4 splice acceptor site (TGAACCTGAACACAGCAGAGGGACA). Morpholinos were dissolved in nuclease-free water and injected into zebrafish embryos at 1- to 4-cell stages in 0.1 M KCl at the specified dosage. The injection volume is estimated to be 1–2 nl. Kidney cortex tissues were obtained during unilateral nephrectomy for renal carcinoma.41 The institutional review board of University of Tokyo School of Medicine approved the study. Human nephron segments were obtained from manual microdissection, as described previously.42 Total RNA isolated from each nephron segments was used for RT-PCR. Primers were 5′-ggtcttcatcctagtgcctg and 5′-caaggtgatgaggtcgcc for SLC41A1; 5′-cgcaaagacctgtacgccaac and 5′-ccacacggagtacttgcgctc for ACTB. Zebrafish embryos were fixed with 4% paraformaldehyde overnight, serial-dehydrated with 25%, 50%, 75%, and 95% ethanol, and then equilibrated with JB-4 solution (Polysciences) overnight at 4°C. The embryos were embedded in JB-4 resin and sectioned with a Leica R2265 microtome. The sections were stained with methylene blue as previously described.25 For immunohistochemistry of human and rat kidney heat-induced antigen retrieval was done, and then paraffin-embedded human and rat kidney sections were stained with anti-SLC41A1 (Sigma Aldrich, St. Louis, MO) and Claudin 16 (Novus Biologicals, Littleton, CO). EnVision+ Dual Link System peroxidase (DAKO, Carpinteria, CA) and 3,3′-diaminobenzidine were used to visualize staining in human tissue. For rat kidney sections, goat antimouse A488 and goat antirabbit A594 (Invitrogen) secondary antibodies were used. The authors thank the families who contributed to this study. We thank Robert H. Lyons for excellent Sanger sequencing. This research was supported by grants from the National Institutes of Health to F.H. (DK1069274, DK1068306, DK064614), W.Z. (DK091405), and E.A.O. (DK090917), and by a grant-in-aid for scientific research from the Ministry of Education, Culture, Sports, Science, and Technology of Japan to T.A. (23390033). F.H. is an investigator of the Howard Hughes Medical Institute, a Doris Duke Distinguished Clinical Scientist, and a Frederick G.L. Huetwell Professor. T.W.H. and E.A.O. contributed equally to this work. See related editorial, “Working Out Nephronophthisis Genetics One Family at a Time,” on pages 865–868. This article contains supplemental material online at http://jasn.asnjournals.org/lookup/suppl/doi:10.1681/ASN.2012101034/-/DCSupplemental. Carrier testing for severe childhood recessive diseases by next-generation sequencing. Sci Transl Med 3: 65ra4, 2011.